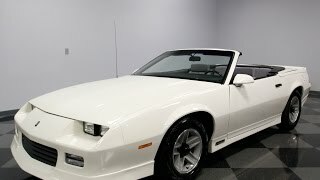 Hi, I am interested in your 1989 Chevrolet Camaro (stock #3983-CHA) listed on Autotrader for $17,995. I'd like to get more information about this vehicle and confirm its availability. Heres a great way to get a speedy classic droptop without breaking the budget. This 1989 Chevrolet Camaro RS convertible has undergone a full nut and bold restoration for a pristine appearance, restored interior, and its rebuilt original fuel-injected V8 making a throaty roar. This is an award-winning car that can easily steal everyones attention for upper teens, and should only apreciate with time and care! These third-generation Camaros are really coming into their own on the classic car market, and thats because either you had one, or envied one at some time in your life. Chevrolet captured the era perfectly with sharp-edge styling mixed with beefy bodylines. Plus, the Rally Sports factory ground effects only adds to this aggression. These convertibles were a special conversion before they hit the dealers, and so there are some unique touches like the nicely integrated rear spoiler with third brake light. Its the unique touches like these that we appreciate all the more with age. And speaking of appreciation, this car has certainly lead a life of privilege so far. The factory-correct white was given a professional respray to continue its superior level of shine. The black folding roof retains its deep, dark appearance, so it can coordinate nicely with the grill and rear panel. Even the factory 15-inch alloys look like they have avoided every curb. When you look inside, you instantly know why this is an Antique Automobile Club of America (AACA) award winner. Its nearly impossible to have bucket seats looking this good, especially on a convertible that can be out in the elements. Thats why there was a significant investment here in 2015 to restore the interior back to factory standards. So the grey cloth remains distinctive, right down to the Camaro stitching on the seatbacks. But more than just look great, this is a comfortable experience with features like power locks, tilt steering, cruise control, and the original AM/FM/cassette stereo. There are even provisions for modern R134a air conditioning. So, youll love slipping behind the stylish factory steering wheel and watch the full gauge package do its dance as you let the wind whip through the cabin. But, we know you want this for more than just for its preservation and presentation. Thats because underneath the hood of this classic is a fuel-injected V8. The numbers-matching 305 cubic-inch powerplant is known for being smooth on the highway and quick off the stoplight. With about 2,000 miles on the fully fresh built motor, you have many miles of fun ahead. Plus, the four-speed automatic transmission w/overdrive also makes this droptop the perfect cruiser. This feeling is heightened by the right driving features, such as the power steering, sway bars front & rear, front disc brakes, and the modern grip of Goodyear Assurance tires. This Camaro comes compete with all the right paperwork, including the factory buildsheet, owners manual, restoration receipts, and maintenance records. But all you really have to do is look at the pristine undercarriage photos to understand the level of care on this car. Its an amazing droptop for an affordable price. Thats why you know you need to hurry to grab this deal. Call now! !